Click the button below to add the Six pieces of DIY toy assembly kit to your wish list. 85mm (length), 75mm (width), 200mm (height). The small table lamp has very simple and classic electric circuits, so students can start their exploration into the wider range of electrical circuits by firstly assembling this model. This control circuit consists of four major parts, that is, the battery, the switch, the LED lamp bead (light emitting diode), and the motor. Therefore, it can be used not only as a technical model training the operational ability of students, but also as a light source. 100mm (Length), 100mm (width), 100mm (height). It’s powered by two 7th batteries. The motor can respectively decrease and increase the output remote speed and torque through a gear drive. The eccentric power wheel at the two ends of gear case’s output shaft can allocate the driving force to the bilateral walking gears, thus allowing the to-and-fro movements of the robot. During the assembling process, student can not only get some knowledge about the mechanical drive system but also have improved operational ability. The walking robot looks very cute, so the students won’t feel bored. 105mm (length)，90mm (width), 117mm (height). After the assembling is done, the car can achieve track driving and excellent off-road performance. In addition, the car can be switched between two-wheel-drive and all-wheel-drive modes. During the assembling process, students can not only grab the speed-down theory and the definition of transmission ratio, but also learn some tips for wiring. In this way, they will have enhanced operational ability and creativity as well as strengthened team-work spirit. 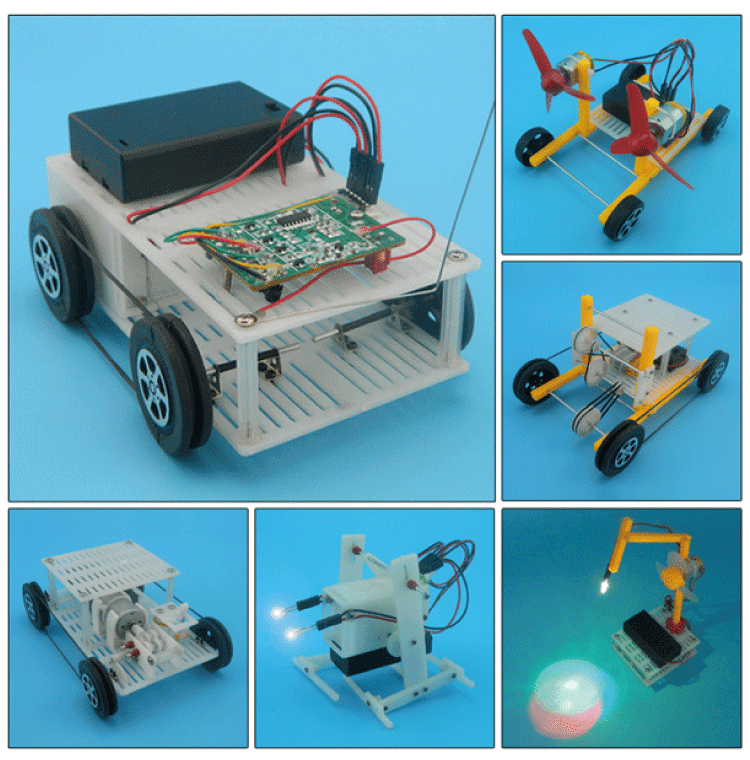 Crawler-type stone-ups remote controlling assembling kits (hand-assembled electronic motor car) 145mm (length), 105mm (width), 70mm (height). This is a strongly operational remote controlling assembling model that is composed of the remote controller, the motor, the power supply, the traveling gear, and the frame. After the assembling is completed, the model can travel across the obstacles set by the book, or across seven standing used batteries arranged in a random order under remote control. By assembling and operating this model, students can not only get some knowledge about the electronic circuit, but also achieve better coordination of the brain and hands. 264mm (length), 109mm (width), 90mm (height). This model can imitate the fish’s swimming in water, and thus can help the students know about bionics and applications thereof.